Rebecca and I have an awful lot in common; we both grew up weirdos in the same tiny mountain town in Northern New Jersey, attended the same high school at different times, have many of the same diagnoses, and even saw the same doctor at one point, long after we had both moved away from home. We had so much to talk about, I had to split our interview into two separate episodes. 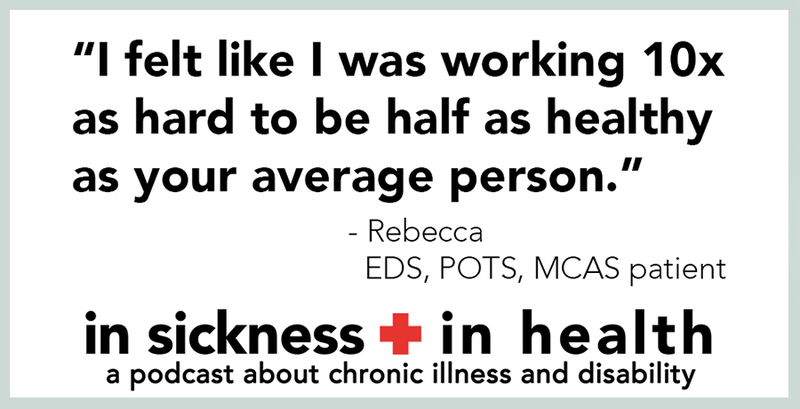 In today’s episode, Rebecca talks about the ups and downs of EDS, their long and winding diagnostic process, working 10x as hard to be half as healthy as everyone else, and redefining their value while not being able to work a paying job. They live with Ehlers-Danlos Syndrome (EDS), dysautonomia including POTS, Mast Cell Activation Syndrome, gastroparesis, and several other diagnoses. Listen below or on iTunes, Soundcloud, Stitcher, YouTube, or wherever you get your podcasts! This episode is the third in a series of interviews with dysautonomia patients. We are posting a new episode every day of this last week of Dysautonomia Awareness Month. Dysautonomia is a blanket term for conditions that affect the Autonomic Nervous System, which is responsible for all the stuff that's supposed to happen automatically in your body. The Dysautonomia Series features interviews with multiple POTS patients with different primary diagnoses to give a better understanding of the varied issues we each face.